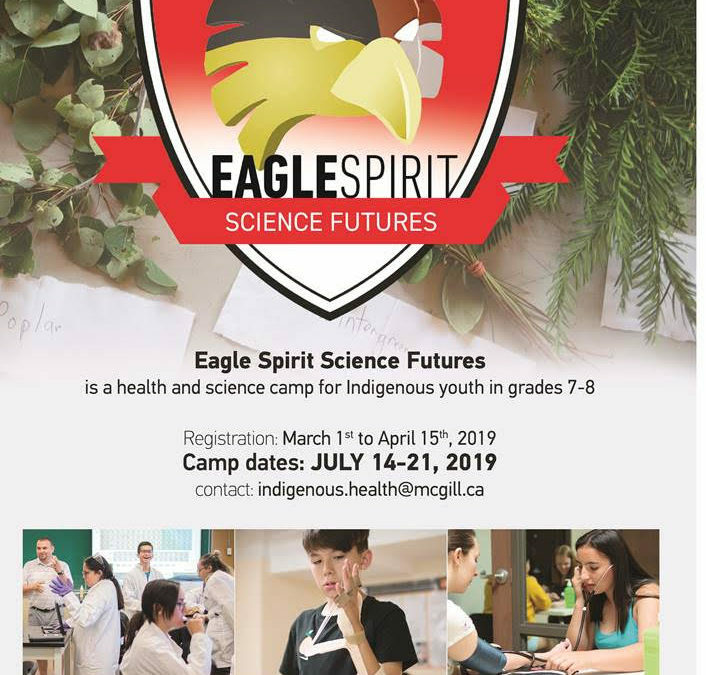 The Indigenous Health Professions Program is excited to announce the beginning of the application period for our 2019 Eagle Spirit Science Futures Camp! We will be accepting applications between March 1st to April 15th, 2019. This one-week summer science and health camp will take place on July 14-21, 2019 and will be hosted at McGill University in Montreal. We are looking to accept Indigenous youth in grades 7 and 8 (Sec 1 and Sec 2) from across Quebec. Please see the Camper Application Form inside this packet for detailed instructions on applying. Previous Eagle Spirit campers/older youth are encouraged to apply to be Junior Camp Counselors. Please refer to the Junior Counselor Application Form for further details on applying. We invite you to promote this camp to your student circles, and to hang up the poster that we’ve included in this package for students to see. Also, feel free to make copies of both the Camper and Junior Counselor Application Forms if you need. Please reach out to us if you have any questions regarding applications, travel and accommodations or the Eagle Spirit Science Futures Camp itself. We look forward to communicating with you in the next few weeks!